Excluding Evan and Cygnus Knights, all classes' 3rd and 4th Job advancement levels will be reduced. 3rd Job advancement will be reduced from Lv. 70 to Lv. 60. 4th Job advancement will be reduced from Lv. 120 to Lv. 100. Job advancement quest levels and quest monsters have been adjusted accordingly. Level restrictions on medals, mounts, sub-equipment and job advancement equipment have been adjusted to accommodate the changes. The required EXP to level up from lv. 60-75 and 100-125 have been adjusted. Explorer classes, Aran, Cannoneer and Dual Blade that use combined SP system will receive 4 additional SP at job advancement. Jett, Zen, Resistance classes, Hero classes, and Mihile that use separated SP system will now receive 5 SP for 1st, 4 SP for 2nd, 4 SP for 3rd, and 4 SP at 4th job advancements. Those that had the job advancement levels adjusted will have all their SP reset, also including the adjusted additional SP. You can teleport to Manon's Forest and Griffey Forest, the 4th Explorer Job Advancement quest maps, by talking to the Forest of the Priest Job Instructors. Levels for Power of the Fairy quests changed from Lv.70, Lv,80, Lv.90, Lv.100, and Lv.110 to Lv.70, Lv.75, Lv.80, Lv.85, and Lv.90 respectively. Lv 80 skill quest which required Panda & Reinforced Mithril Mutae now requires Grizzly & Reinforced Iron Mutae. Lv 85 skill quest which required Bone Fish & Master Soul Teddy now requires Panda & Sand Dwarf. Lv. 90 skill quest which required Gold Slime & Hankie now requires Buffy & Peach Monkey. There is no longer a time restriction on when you can obtain Honor EXP in Azwan. The experience you obtain from killing monsters in Azwan has been changed. When using a Circulator, you now have a higher chance of getting B, A and S ranks. The existing Rank 10 and Rank 9 Circulators will function as Rank 8 Circulator. The existing Rank 7 and Rank 6 Circulators will function as Rank 5 Circulator. The existing Rank 4, Rank 3 and Rank 2 Circulators will function as the Special Circulator. When Circulators appear in Jean Pierre's shop, you can buy up to 30x Rank 5 Circulators and 10 Special Circulators. Honor EXP needed to raise Honor Level has been decreased significantly. The Free Market entrance map has been given a makeover! Now you can check out how your character would look in the latest fashions, right on the big screen TV! The maximum character slots per world has been increased from 15 to 18. Some bosses now have a visual indicator (aka an "aggro" meter) as to which player has their full attention. Substat class restrictions have been removed on most equipment. Some of the Potential stats of Lv. 60 and Lv. 100 weapons and sub-equipment has been adjusted. Dring his battle with the Black Mage, Luminous along with the other Heroes, managed to seal him away. But not before the Black Mage could impart some of his darkness on to Luminous. Luminous must now learn to control the awesomely terrifying power of the Black Mage before it threatens to consume his soul and plunge him into the world of darkness. There are two version of Luminous UI. 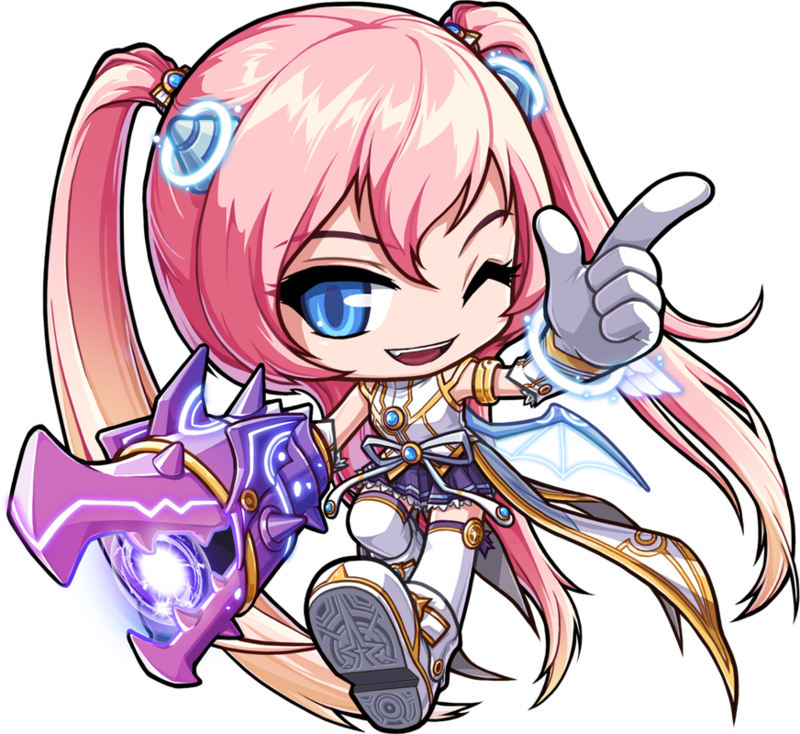 The Global MapleStory version of Luminous is a bit different from the version of Luminous in the Korean and other versions of MapleStory. 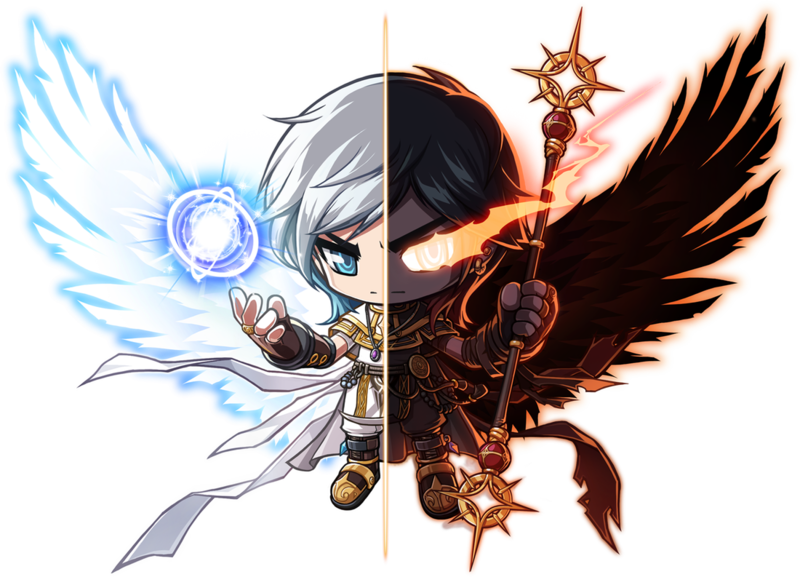 In Korea MapleStory and other MapleStory version, after completing the tutorial, there is a choice between Light and Darkness. These choices will slightly affect the storyline and grant him Light Affinity or Dark Affinity respectively, which increases the damage of the respective affinity. 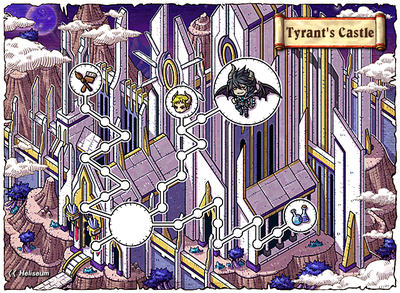 Once the player uses a skill, light or dark, the orb will immediately fill up with 100% purple or blue, respectively. Using light magic will increase the dark side of the orb until it is fully purple, activating Eclipse, and vice versa will activate Sunfire. 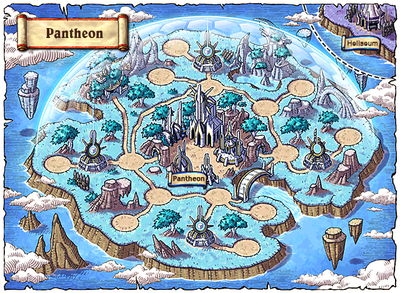 In Global MapleStory version, the quests and skills have been modified to adjust gameplay flow. You won't choose between light/dark in the beginning tutorial, and there will only be one story. The story will be based on the Dark side, wherein Luminous is conflicted about the darkness within him. 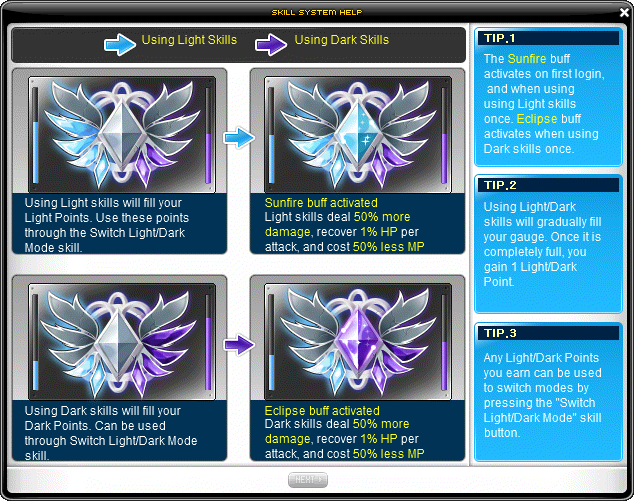 You will have access to light and dark skills, with the ability to switch between the two and activate buffs that will enhance one or the other attribute. You will gain the light vs. dark gauge when you complete your 2nd job advancement, at which point you will also be able to switch between light and dark modes. When switching between light and dark modes, you'll briefly enter an Equilibrium state. Long ago, the legendary Nova Warrior, Kaiser, protected Pantheon and the people of Grandis from Magnus, a power-hungry emissary of the Black Mage. The two powers collided, and in the end Magnus, along with his army of abominations, proved to be the stronger of the two. Faced with certain defeat, Kaiser unleashed an all-consuming attack, eradicating Magnus's creatures and destroying his own physical form in the process. But his spirit lived on, waiting for the perfect host to receive his power. A young Nova boy named Kyle forms the Heliseum Force with his friends Velderoth and Tear to protect the people of Grandis just as Kaiser did long ago. When Pantheon is in danger and all seems lost, Kyle finds himself infused with an unknown source of energy. 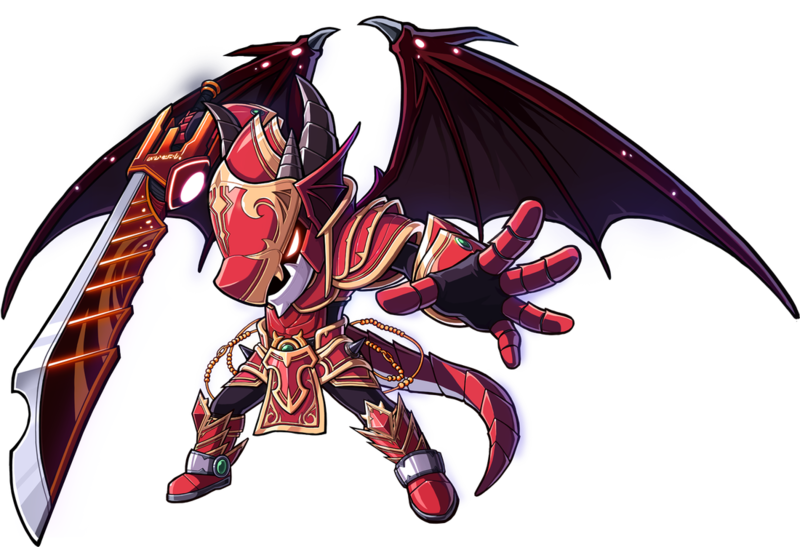 Through Kyle, the great dragon warrior Kaiser is reborn! 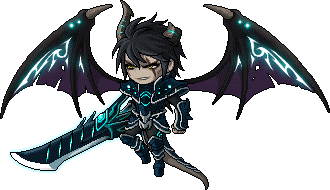 Use special attacks to fill the Morph Gauge to transform into Kaiser's ancient dragon form, which increases Kaiser's strength and mobility. As you level your Kaiser, you'll reach new transformation stages with distinct looks. 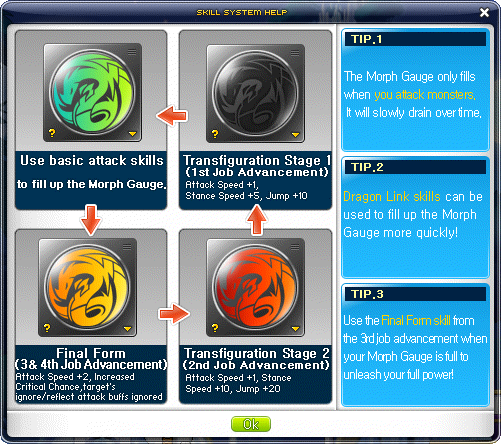 The Dragon Link UI sits below the Morph Gauge and allows you to assign certain abilities to key combinations (i.e. Left, Right + Attack, or Left, Down + Attack, etc). These skills can also be added to your Quick Slot hot keys like other abilities. However, using the Dragon Link key combinations will fill your Morph Gauge faster! 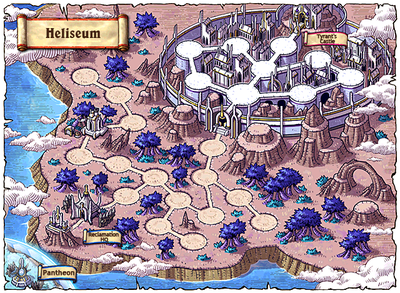 Heliseum is the capital of the planet Grandis, home to the Nova race. After being conquered by Magnus, it is now home to Tyrant’s Castle, his seat of power. 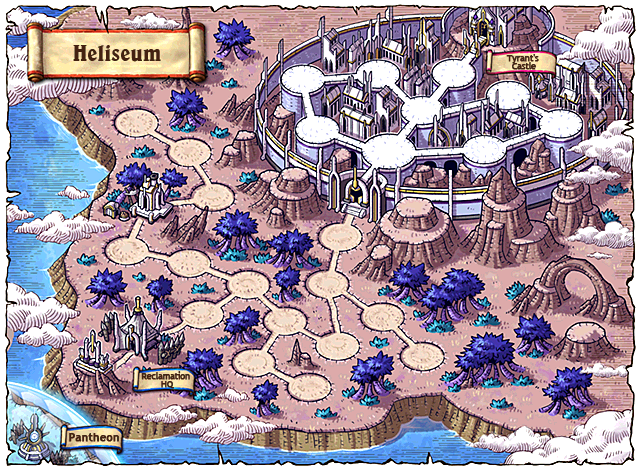 After the amazing feats of Kaiser and Angelic Buster, the Nova established the Heliseum Reclamation HQ in Pantheon to try to reclaim Heliseum with the help of the Maple Alliance. 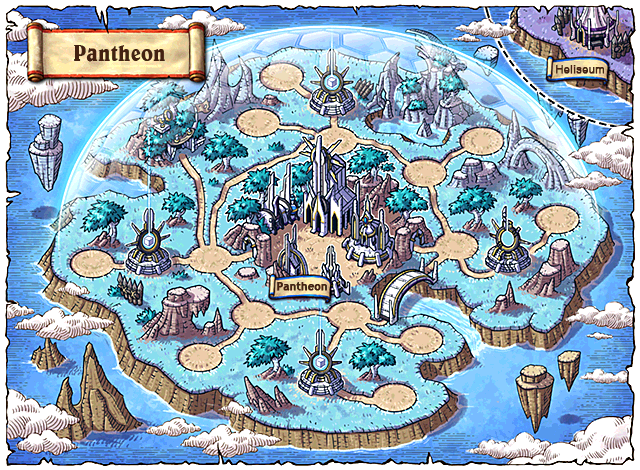 You can get to Pantheon by using the portal located in the Six Paths Crossway on Victoria Island. You must make your way through the Heliseum, defeating Magnus's top lieutenants to gain access to his lair and take the capital city back for the Nova. Band together with your fellow Maplers to defeat the evil Magnus! Requirements: Lv 100 or above. Must be in a party. Magnus has Normal and Hard modes. Magnus is Lv. 160, but even the most experienced Maplers will find him difficult to beat! Magnus has a special zone around him. If you fall outside of this zone, expect negative consequences. Magnus drops Shadow Merchant Coins, which can be used to purchase Nova and Tyrant gear from Mayala in Downtown Black Market. When the Heliseum Force is overwhelmed at Pantheon, Tear calls on the power of an ancient relic to save her friends. Her plan works, but she gets much more than she bargained for. Now, the voice of the ancient Nova dragon warrior, Eskalade, rings out in her head. It tells Tear of her new destiny... to become the Angelic Buster! Soul Battery skills are powerful attacks that must be recharged after use, and the only way to recharge them is by attacking enemies! Different attacks will recharge the skills at different rates, and the Affinity Heart skills can help them recharge faster. You’ll know a skill needs to be recharged when its icon turns gray. 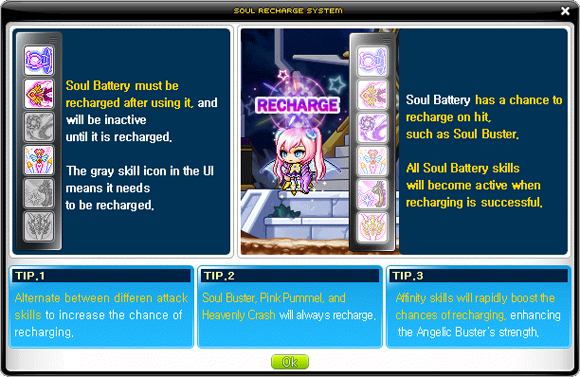 The Soul Battery UI lists all available Soul Battery skills and their availability. New Hyper Skills have been added for the following Hero and Nova classes: Aran, Evan, Mercedes, Phantom, Luminous, and Kaiser. Hyper Skills have three categories: Passive Stat Boost, Passive Skill Boost, and active Attack/Buff skills. Each category has its own SP. 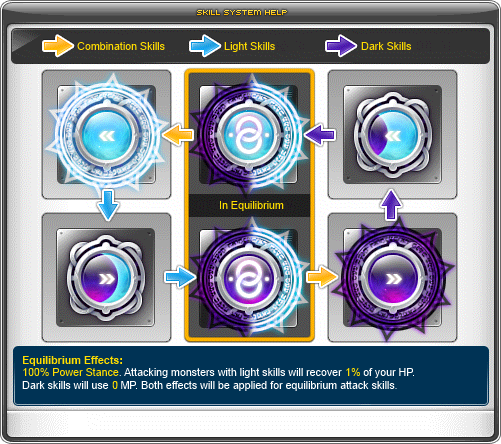 Hyper skills can be reset for a fee of anywhere between 100,000 to 10,000,000 mesos. Hyper skills are not affected by buff duration increase or cooldown decrease. All skills Master Level = 1.